Six nights of live theatre will be capping off four years of education for a group of TRU students. They’re part of the theatre program and will be filling the Actors Workshop Theatre in Old Main from April 8 to 13 with productions done completely by students. Hall is one of the fourth-year students in the directing course. He’s taking on Steve Yokey’s Bright. Apple. Crush., a dark show looking at murder and has three actors to guide. This will be the first time the directing students get to direct a whole play that will be performed for a paying audience. Over the six nights seven short plays will be acted out. “It’s like trail mix but good,” said third-year actor Brooke Ballam, describing the variety of plays lined up. He’s one of the actors working with Hall in Bright. Apple. Crush. which is the darkest play to be performed. Mary Just Broke Up With This Guy is a comedy with an actress playing a single character while her male counterpart goes through many character changes. The seven plays are split into a group of three, or Night A, and a group of four, known as Night B. 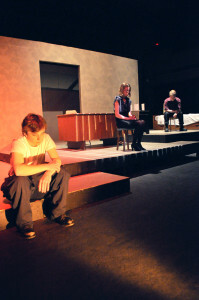 Night A will be performed April 8, 10 and 12 while Night B is April 9, 11 and 13. Tickets are $12 for one night or $18 for both. The university newspaper writing about Director Festival. A pretty decent article.